Hirokazu Kore-eda’s Shoplifters was a surprise appearance at the Oscars, where it received a nomination for best foreign language film. Kore-eda gives voice to the age-old ethical dilemma: would you steal bread to feed your family? From the opening scene, the audience is made hyper-aware of the routines and rituals between a father and son as they steal from small shops to feed their family. On the way home from their day’s work, the two sort of kidnap a young girl who becomes assimilated into their little family when her family doesn’t notice her disappearance. 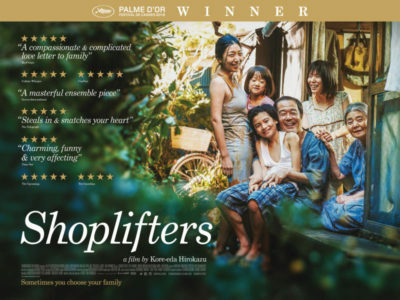 Shoplifters creates gray-area dilemmas that are frustrating to endure and made me question the definition of family, theft and loss, but are a beautiful portrait of the parts of life we all tend to ignore. Want to have the ground under your feet shaken up? Watch Kore-eda’s masterpiece level Palme d’or-winner Shoplifters.